The People Behind Your Chocolate: A Small Farmer Tour | Small Farmers. Big Change. An event at Brattleboro Food Co-op in Vermont. As you may have heard, we were fortunate to have two visitors from CONACADO cacao co-op in the Dominican Republic visiting for almost a week: Basilio Almonte de los Santos, an agronomist at CONACADO, and Ramon Matias Frias Gonzalez, a cacao farmer, member of CONACADO’s Bloque 9, and Secretary on CONACADO’s Board of Directors. We’ll definitely be sharing more about this visit in the weeks and months to come (like the upcoming issue of Equal Exchange’s newsletter), but here’s just a quick summary of the trip. While Equal Exchange worker-owners have the opportunity to visit our farmer partners, our customers rarely have the chance to travel and meet the farmers behind their coffee, tea or, in this case, chocolate and cocoa. Organizing tours, like this one with Basilio and Ramon from the Dominican Republic, helps provide that personal, direct connection between our customers and the people behind their food. So what did we do while they were here? Basilio and Ramon arrived late last Thursday. Avid baseball fans, they were excited to visit Fenway Park and get “Big Papi” burgers at a nearby restaurant. That evening, we took them to another Boston institution for dinner – Doyle’s Café in Jamaica Plain. Friday began with a visit to the new Equal Exchange Café near North Station T Stop in Boston. Basilio and Ramon were just as excited about being at the Café as customers were to meet them; Basilio and Ramon were touched to hear how much people value the chocolate and all the ways people support Equal Exchange, from selling at church to frequently visiting the EE Café. Later that day we visited another café and store, City Feed & Supply in Jamaica Plain. 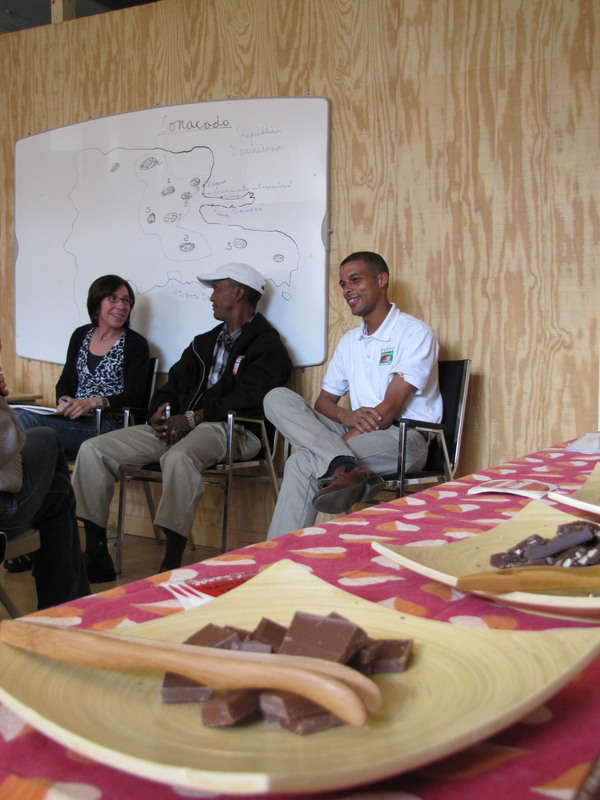 People don’t often associate chocolate with farming, so were really interested to hear about the work of Basilio and Ramon to produce the cacao in Equal Exchange’s chocolate and cocoa. That evening ended with a great presentation to about 80 people at the JP Forum. Basilio appreciated how engaged audience members were, and that people had so many questions! 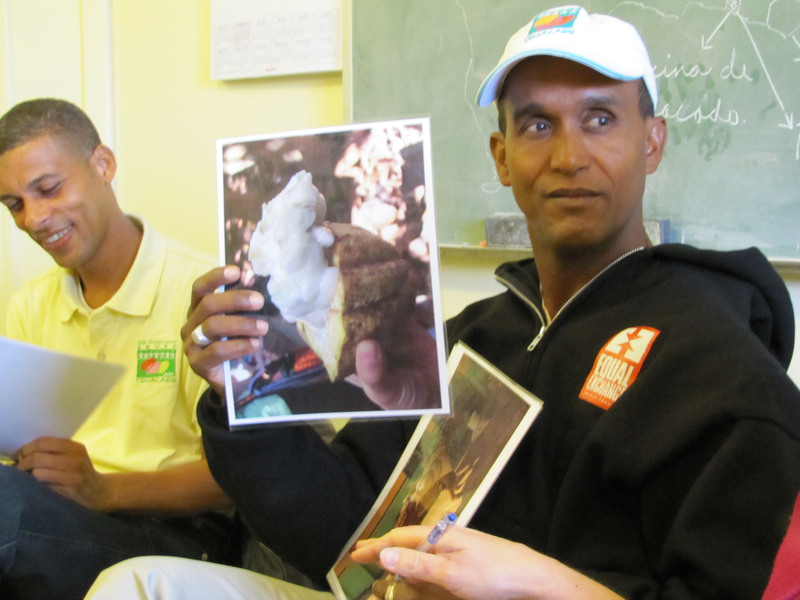 L-R: Basilio Almonte de los Santos, an agronomist at CONACADO, and Ramon Matias Frias Gonzalez, a cacao farmer, member of CONACADO’s Bloque 9, and Secretary on CONACADO’s Board of Directors. 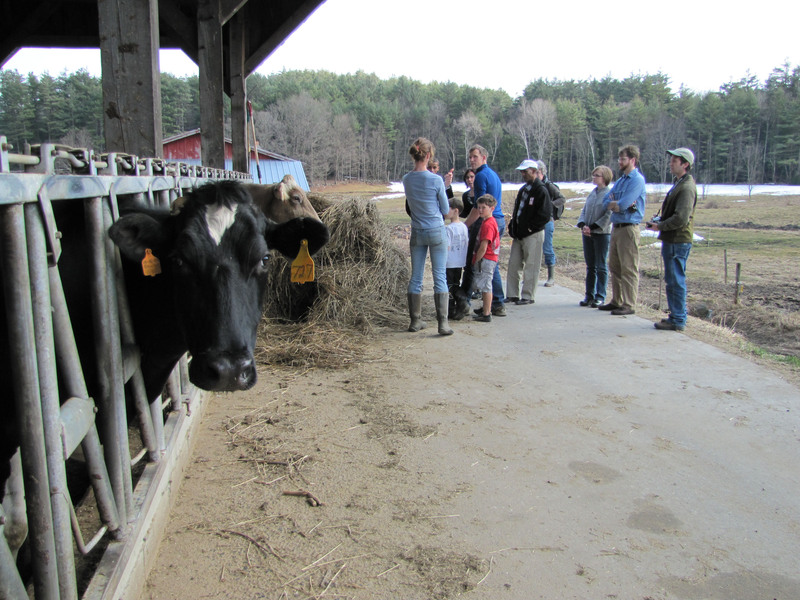 The visitors from CONACADO toured Lilac Ridge, a member of Organic Valley dairy co-operative. Over the weekend we traveled to Brattleboro, VT and Albany, NY. In Brattleboro, Basilio and Ramon gave a presentation at the Brattleboro Food Co-op, followed by a tour of a local dairy and maple syrup farm. The farm, Lilac Ridge, is a member of Organic Valley Co-operative. We discovered that making maple syrup is complicated, and at one point Basilio asked, “So, why do you do this?” They marveled at the scale of the farm, noting that a “small farm” in the U.S. is a large farm in the Dominican Republic. From there we headed for Albany, NY. Sunday morning we visited Honest Weight Food Co-op, where Ramon and Basilio shared their stories and met with shoppers. After seeing both Brattleboro and Honest Weight, they were really impressed with the consumer co-op model, noting that people seemed like engaged and conscientious shoppers. In the afternoon, Basilio and Ramon gave another presentation at St. Michael’s church in Troy, NY. This event featured a chocolate fountain and ended up being a favorite of Ramon and Basilio because there were so many enthusiastic people. We were fortunate to spend Sunday evening with Anne Kelly from the Labor-Religion Coalition, part of New York State Union of Teachers (NYSUT), and some students at the Emma Willard school that are working to make Emma Willard a Fair Trade school. 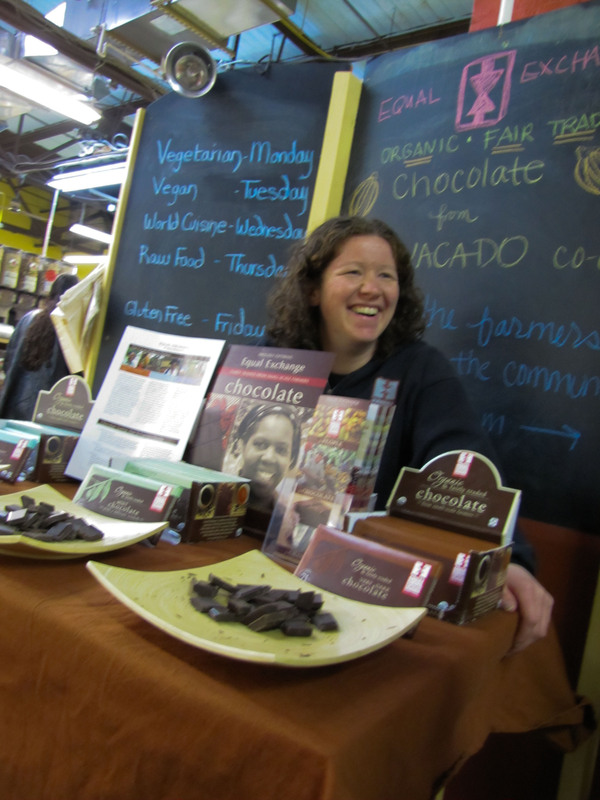 Natural Foods Sales Rep. Pfeif samples chocolate from CONACADO at Honest Weight Food Co-op in New York. On their last day, Tuesday, Basilio and Ramon traveled around Boston visiting four schools with our Fundraising Program reps. At the end of the day, they were very excited to show us letters from the students, which were very sweet!